On June 10, 2016, Paséa Hotel & Spa—the newest addition to the Meritage Collection’s portfolio of lifestyle and luxury hotels and resorts—officially opened. CNN quickly named the hotel to its “6 of the best new U.S. coastal hotels” list. 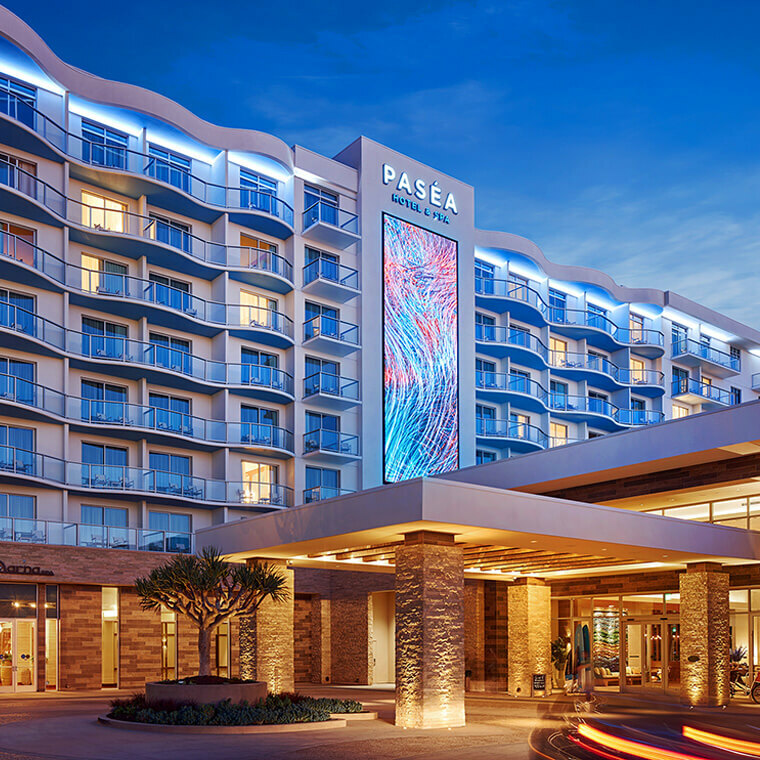 Overlooking the Pacific Ocean and located just steps from the Huntington Beach Pier, Paséa is inspired by the vibrant artistic culture of the area, from its spa and signature restaurant to its expansive meeting and event spaces. At Paséa, you’ll find a classic coastal vibe with a unique design and casual style of service. The 250 guestrooms offer spectacular views of the coastline. Inside, the hotel features artwork from local California artists and offers a state-of-the-art fitness center, complimentary bicycle rentals, yoga classes, and a pool area featuring an outdoor pool, a whirlpool spa and VIP cabanas with table service. Signature restaurant Tanner’s provides stunning floor-to-ceiling views of the Pacific Ocean with fresh Southern California cuisine, blending locally grown ingredients with innovative techniques. Meanwhile, Blend Café serves up a more casual experience with fresh coffee, unique gifts, healthy snacks and early-evening wine by the glass and bottle, which can also be enjoyed in the adjacent Study. Guests looking for a special spa experience will find one at Balinese-inspired Aarna Spa, which spans 5,800 square feet with eight treatment rooms, relaxation room and outdoor garden. Whether you’re a skilled surfer or a beginner, Paséa’s dedicated Beach Butlers can arrange lessons with local instructors, share the latest weather and tidal reports, provide supplies like sunscreen, surfboard wax, beach chairs and even offer a lift to the sand in the Paséa-branded pedicab. Paséa also offers 11 meeting rooms and more than 34,000 square feet of oceanfront event space. To book reservations or learn more about Paséa Hotel & Spa, visit PaseaHotel.com, or call 844.814.2483.